Question: What Glue Is Best For Quilling? You want to keep your quilling free from any traces of glue so choose one that dries to a clear finish. Lake City Craft Glue, Eileens Tacky Glue, and Elmers glue all work extremely well on standard quilling paper. The important thing to remember is to use as little as possible. When using paper with a shiny finish like pearls and metallics that take longer to adhere you will need to hold the glued edges together longer or you can use a faster setting glue. Question: Is Quilling Difficult to Learn? Quilling is easy for people of all ages to learn. It just takes time and patience. Question: What Tools & Supplies Do I Need to Start? Question: What Quilling Tool Should I be Using? You should use the tool you feel most comfortable with. Most beginners find the Slotted Tool easier to use while they are learning and then progress to the Needle Tool when they become more accomplished. Question: Does It Make A Difference Which Tool I Use? Beautiful Quilling can be made using any quilling tool, but there are differences to the finished product depending on the tool used. These differences can be seen by looking at the center of a rolled coil. The Slotted Tool leaves the largest center hole and a bend or kink in the paper where it fit into the slot. The Needle Tool leaves a much smaller center hole and no bend in the paper. For an even smaller center hole in your rolled coils, a corsage pin can be used. Question: How Do I Keep My Fine Tip Glue Bottle From Clogging Up? Fine Tip Glue Bottles can become clogged up when glue has dried and hardened in the tip. For this reason you should keep the Rustproof Pin that comes with the bottle inserted in the tip when you are not using it. While you are quilling, you can keep the glue bottle in a container upside-down on a moistened cloth or paper towel to keep the tip clear. Make sure your cloth is not too wet, or your glue will become diluted - just use a couple drops of water. Below is a picture of the container I use for my glue bottle. 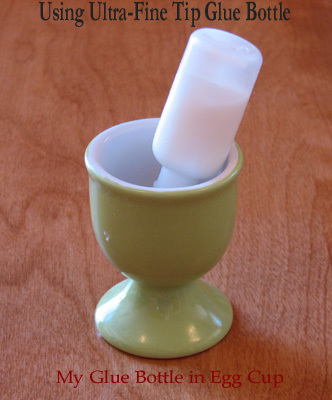 It is a glass egg holder that is heavy enough to keep from tipping over with a full glue bottle leaning against one side; and low enough that I can easily grip the bottle when I need it. Question: How Can I Unclog My Fine Tip Glue Bottle? You can unclog the fine tip of your glue bottle, by removing it and letting it soak in warm soapy water to soften and disolve the trapped glue. Thoroughly rinse and dry the tip before placing it back on the glue bottle. If your tip is still clogged up, try soaking it again to soften the glue and then thread a piece of SuperFloss down the barrel - slide the tip back and forth over the thick spongy end of the SuperFloss to remove all traces of glue. Below is a picture of a fine tip with SuperFloss inserted down the barrel. Question: Why Can't I Fit My Pieces Into the Design From A Quilling Pattern? Knitters know they have to check their tension before starting a project because if they don't the finished item may end up being either too small or too large. Quillers can have this same problem when working from a published pattern because their rolled coils are not the same size as the coils made by the author of the pattern. That is because their Tension is different. How do knitters work around this problem? They knit a test square and check it against the pattern. If their tension is too tight, they change to a larger needle. If it is too loose, they use a smaller needle. Roll a coil using the length of paper specified in the pattern, press into a shape shown in your design drawing and compare it's size against the drawn shape. If your formed shape is larger than the shape in the design drawing, your tension is looser and you need to use a shorter strip. If your formed shape is smaller than the shape in the design drawing, your tension is tighter and you need to use a longer strip.